Baseball scrapbook layout pages might not be a UK scrapper's first thought, but if you've relatives 'stateside', then you just gotta scrap those 'Lil Leaguers!' I have not yet met my lil' relatives but hopefully they'll look at this site and demand to know who's responsible! My aunt kindly sent me these photos of two very cute fellas. I was pleasantly surprised to receive a photo of cheerleaders included in the collection! I was going to build the layout round them but thought better of it. I was pleased to find two papers from Cherry Arte which were ideal for this layout: The 'stars and stripes' design for the central journaling feature, and the spotted paper - which I chose to symbolise crowds of sports fans at a game. Baseball layouts are much the poorer for no hats, bats and balls. I got these stick-ons from Stickpotamus, and I found that a bat and ball also works great as an exclamation mark. I then used Gold Letraset for my rather obvious baseball 'soundbite' journaling! BACK TO THE DRAWING BOARD, GUYS! 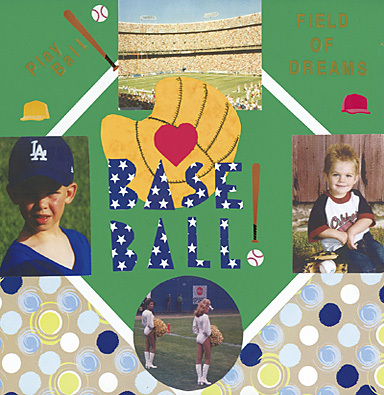 Although I did plan this baseball scrapbook layout around the 'in-field' (hope I've got that jargon right), I would have benefitted from Jen Gormley's book '500 Scrapbooking Sketches' , which contains some great templates to help us map out our page design before we start. Half way down this page you'll see a very good example of how a line drawing can 'morph' into a great layout. of your favorite famous baseball players past and present.